Whether they’re shooting covers for Vogue Germany, Vogue Russia or advertising campaigns for the likes of Blumarine or Givenchy Jeans, Luigi & Iango always deliver knockout fashion imagery. 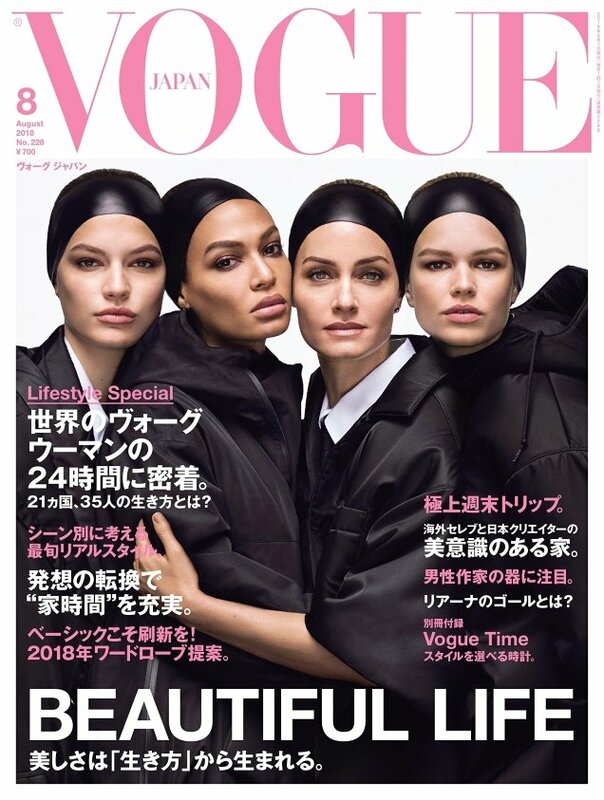 The duo is back shooting Vogue Japan’s cover for August 2018 after a month’s hiatus, as models Faretta, Joan Smalls, Amber Valletta and Anna Ewers huddle together for the magazine’s signature group photo wearing an array of all-black Prada looks. Alongside the newsstand cover (below), Luigi & Iango released some alternative cover teasers (after the jump) which feature each girl solo, complete with styling from Anna Dello Russo and Sabino Pantone throughout. Members of our forums began to call out their favorite almost immediately. “That Anna Ewers cover is STUNNING! My goodness my eyes went straight to it. Gorgeous,” raved MON at once. “Yep, here for Anna’s cover and nothing else,” added dodencebt. “Great covers. They should regard Anna as an industry icon at this point. All these covers, campaigns, beauty and fragrance contracts, and shows for years,” applauded dontbeadrag. Sharing the same sentiments was GivenchyHomme. “That close up of Anna is amazing! It looks like a modern version of Vogue Italia. It’s good! The rest is very so so,” he voiced. “First time in a long while I’ve actually liked a picture of Anna Ewers,” confessed YohjiAddict. The group cover was left in the shadows. “The solo covers are SO much better. They are all stunning! The group shot… meh. It just doesn’t work,” said guimon. “The group cover is not interesting, I mean the shot is not bad but hasn’t that eye-catching level. Solo covers are absolutely better: they look fresh, modern and captivating,” biagiolr stated. Check out the rest of the cover shoot and share your thoughts with us here.